It's easy to say that El Socorro might be the best farm in Guatemala. Run by our longtime producer partner Juan Diego De La Cerda, it has a legacy of winning multiple Cup of Excellence honors each year. Juan Diego grows a large variety of coffees at El Socorro, however our personal favorite is his Maracaturra varietal. The terroir at El Socorro perfectly expresses the Maracaturra better than any other. This varietal is a cross between the very rare Maragogype and the very common Caturra. 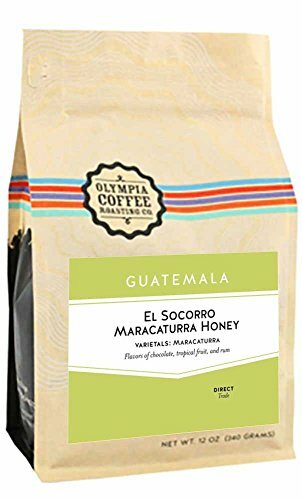 This year, we worked with Juan Diego to create an Olympia Coffee exclusive offering: Honey Processed Maracaturra. Honey Processing leaves a bit of coffee cherry intact after pulping, skipping fermentation altogether and allowing the coffee cherry's natural sugars to marinate into the bean while sun drying. The result is a lush, fruiter version of what is already one of Guatemala's greatest coffees. If you have any questions about this product by GoCoffeeGo, contact us by completing and submitting the form below. If you are looking for a specif part number, please include it with your message.